Yes, the last time I will post up a Hebridean photo either until we get back from this year's trip, or at the least until we are there if I can find an internet cafe that are happy to let me download pics from my laptop or HDD. We head off on Friday afternoon - driving North via the east of the country and the A1. Cut across to the west and join the M6 near the Lakes, and continue up into Scotland stopping overnight at Stirling. On Saturday we keep going North west, via Fort William until we reach Uig on the Isle of Skye where our ferry to North Uist will sail from. We are then based on North Uist for the first week, before crossing from Berneray across to Leverburgh on Harris the following Saturday, and on up to Holm, near Stornoway for our second week. We're hoping for - although not expecting - some good weather. This time of year the Hebs usually get a good mix of sunshine and showers so fingers crossed for more of the former! 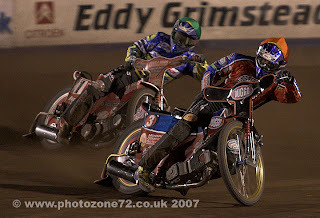 An horrific night of speedway on Thursday night - Entering the back straight for the first time in the opening heat, Reading's Sam Simota and our own Mark Loram tangled together and both smashed through the fence. Sam escaped with cuts and bruises but Mark was not so lucky - he is currently laid up in hospital with a badly broken leg and broken arm. 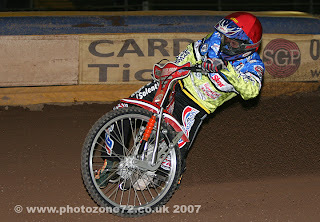 This weeks speedway shot therefore is actually one I took last week - Mark in flying style on his way to scoring maximum points for the witches. Mark was in his first season when I first went to speedway in 1987. I watched him race in my first ever meeting and have supported him ever since. In 2000 he was World Champion - the last Britain has provided to date. He has been British Champion on several occasions and has ridden in just about every country across the world where speedway has been heard of. He's one of the most exciting racers that you might have been lucky enough to have seen - rarely reaching the first bend at the front of the pack and invariably battling through from the back to earn his points and thrill the crowds at the same time. Speedway world champions that is, and all four from the USA. This was taken at a very cold Monmore Green Stadium, Wolverhampton, on Sunday. 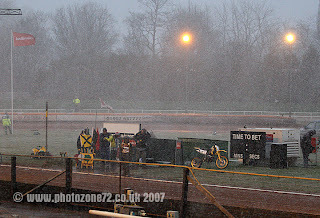 Possibly the coldest weather I've ever encountered whilst watching speedway and certainly the only time I can ever recall seeing that amount of snow at a meeting! 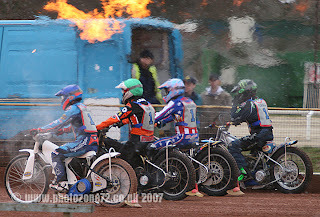 From nearest the camera you have Greg Hancock, Billy Hamill, Sam Ermolenko and finally Bruce Penhall. Thanks to the terrible weather settings on the afternoon ranged from ISO100 at one stage in brilliant sunshine which left me struggling to keep shutter speeds down anywhere below 1/500th (really too fast for speedway) up to ISO1000 and not able to get anything quicker than 1/60th. By way of a second shot - have a blizzard! 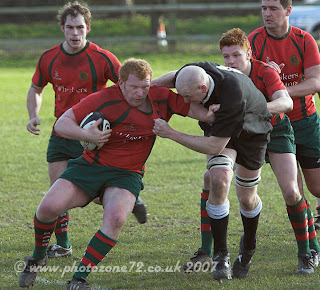 I think I'm starting to get the hang of the rugby thing. Today it was still tricky to keep up with the action but I'm starting to anticipate things a bit more and have certainly got more of the sort of shots I'm after. One of the few usuable ones from a disappointing trip to Arena Essex last night. In spite of being told we were cleared for the centre green beforehand myself and others were then told that we couldn't go out there after all, and instead we would have to shoot from the outside on the stock car track which, of course, precluded the use of flash. Very cross indeed but nothing we could do about it whatsoever. after firing off a few test shots I decided my only option was to shoot in RAW and try to drag some exposure back in processing, which is what I did. The shot above was at ISO1600, 1/200th at f2.8. Thank goodness for the new lens! Rugby this afternoon so there might be another post later on. Well, it must be Spring now - speedway has started again! I now have a very steep learning curve to get used to the 70-200mm with it's considerable weight - after two days of using it I'm wishing I'd done a little more preparation work as my shoulders and back are rather stiff! I've had a good start to the season as I had centre green access at Foxhall last night (where the shot above was taken) and pits access at Arena Essex this evening. That was also meant to be full access to the centre as well but someone had a last minute change of heart which left four of us shooting from the outside and absolutely fuming! The shot above is 1/200th at f2.8, ISO 400, using the 30D with the 70-200mm at the short end. These grave slabs are at St Clements church at Rodel in South Harris. We stopped here on the Saturday we went between the southern and Northern chain of islands, and found it to be a quite wonderful building. This year we're aiming to spend at least one full day exploring a little more of Harris. We've stayed in Tarbert several times but other than that immediate area most of what we have seen has been just "passing through". 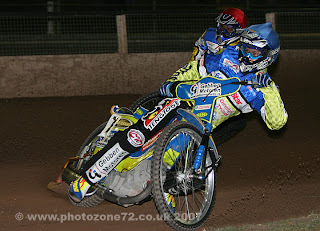 This weeks countdown post is a little earlier than usual as the speedway season has started again. With a little luck I might have some speedway shots to post here in the next few days, and if the weather stays fine I intend to take in some rugby on saturday! Well the holiday seems to be creeping up startlingly fast now! Just three weeks to go and we'll be on our way. This weeks shot is "Hebrides" the ferry which travels between Uig on the Isle of Skye, and Lochmaddy on North uist, on which we will be crossing to the Islands again this year. Caledonian MacBrayne (Or CalMac as they are usually known) run all the ferry services across to the Hebrides and we seem to have been on quite a few of their vessels now. Crossing from Uig has the advantage that the ferry port is right next to the Isle of Skye brewery - so we shall be "taking on supplies" while we wait for the boat! This shot was taken on a walk along the beach at Holm on our first morning at Bayview last year. All the time we were out it kept showering and then stopping, showering and then stopping, until it culminated in one almighty downpour which left us soaked! The light rain coupled with the generally overcast conditions meant that the colours in the pebbles were absolutely amazing though. It suddenly occurred to me the other day that after this one there will only be another 3 of these shots to be posted before we go away and start taking some new ones!